Today is World Book Day, as celebrated in the UK and Ireland. Other countries mark the day at different times of the year, usually in April. Whenever it takes place, World Book Day is intended as a global celebration of books and reading. 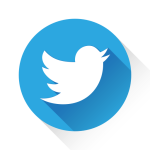 It was designated by UNESCO (United Nations Educational, Scientific and Cultural Organization) to heighten awareness of the importance of literature for a fulfilling life. Never before have we needed to read so much. At a time when people are worrying more than ever about the permanence of their work or the stretchability of their wealth, just six minutes with your nose in a book can reduce stress levels by 68%. But in case you’re not one to crack open an old tome, then fret not: the 21st century is giving books a whole new look to ease-up and improve reading experiences. It’s hardly surprising I suppose that books haven’t escaped unscathed from technology’s ruthless march. In the last couple of years alone, we’ve said hello to the Sony e-reader, Amazon’s Kindle and lately the Apple iPad. In December 2008 Nintendo launched their Classic Books Collection (CBC) in Europe (it’s set for release in North America in this June), a computer program made for the Nintendo DS that includes 100 works of classic literature. 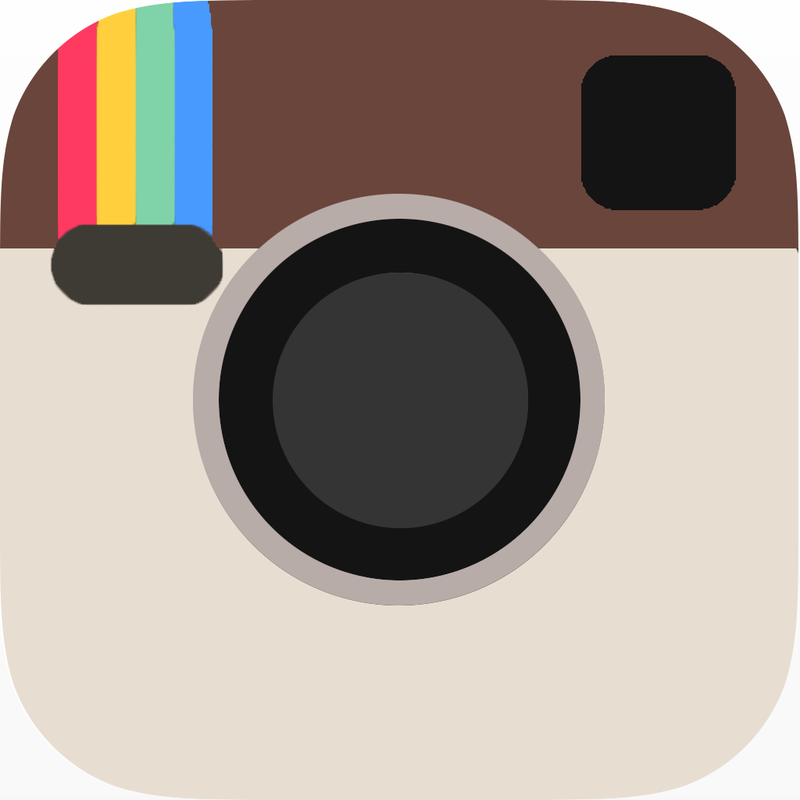 In the UK, take-up has been overwhelming, turning the CBC into a top-selling product, as suddenly square-eyed kids and teens have started trawling their way through Oliver Twist and the like. Whichever way you get your lit fix, there’s a painting at the NGA that shows the story of a reader’s absorption. 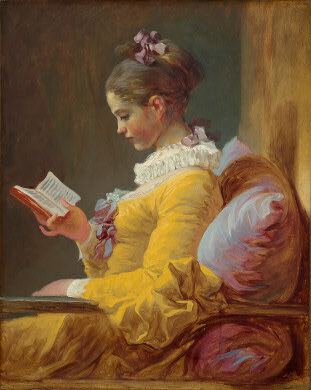 It’s called A Young Girl Reading (c. 1770) and is by the French artist Jean-Honoré Fragonard (1732 – 1806). From the town of Grasse in southeastern France, Fragonard was a rapid, spontaneous painter. His whipping brush and gorgeous colors well embody the ebullient Rococo aesthetic that prevailed in France at his time. This picture just glows. The girl seems to be sitting before a window (light illuminates her face and body and casts a faint shadow on the wall). 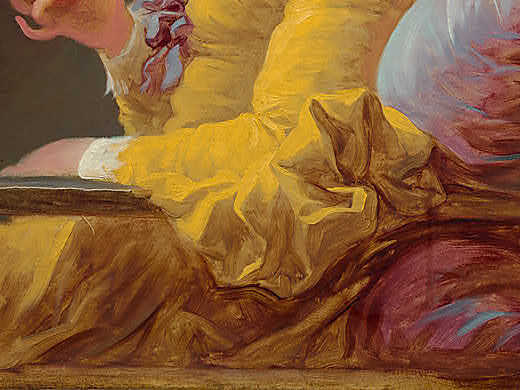 Thick, weaving brushstrokes create the shaded contours of her yolk-yellow dress, concentrating on her sleeve, causing it to bloom over the armrest. The fat, cushy pillow propped against the wall is sketched in with a looser hand, its sinkable-in shape moulded to the body of the girl and showing a shimmering blend of mauve and lilac thread. 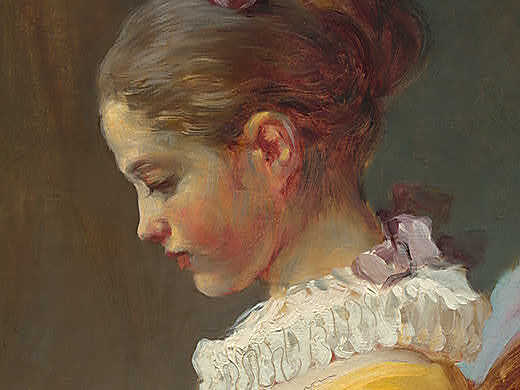 These striking colors are picked up in the crinkling hair ribbon and the flutter of bows on the girl’s bosom. 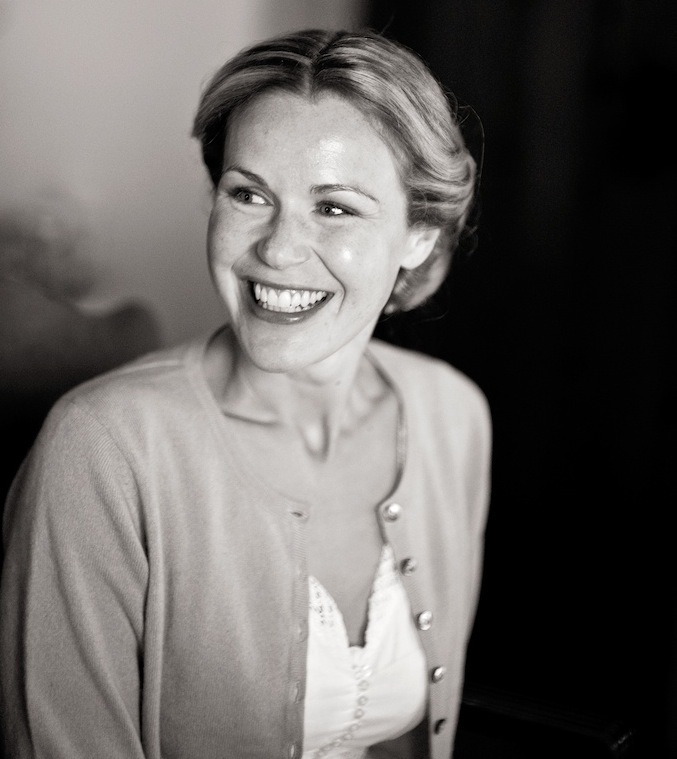 The flush on her cheek stands out against the white collar, sharp-edged with the handle of the painter’s brush. As well as all this surface charm, there’s a sure solidity underpinning the picture. Look for the vertical of the yellow-brown wall and the horizontal line of armrest in the foreground, creating a visual frame that squares off the scene. It’s Fragonard’s way of focussing our eye on an intimate moment, watching this young girl escape into a book. 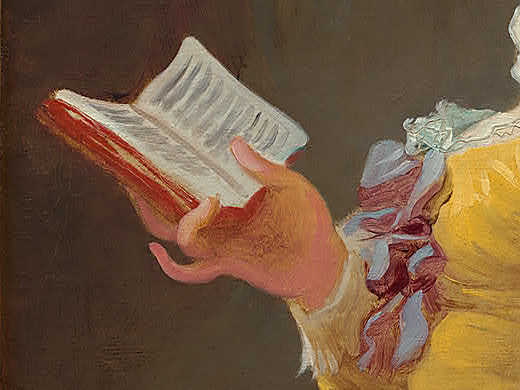 With his confident colors and bravura brushwork, Fragonard seems to be celebrating the act of reading, in his own particular way. There’s genuine sensitivity in his rendering of her face, attentive and coming alive with the words on the page. This is what’s worth remembering as people pursue the “next big thing” in reading gadgetry. After all’s said and done, it’s just the story that matters. A great yarn, well told, will jump off the page no matter what. Just ask Mr Dickens, last seen on your kid’s Nintendo.